The Mac is quite possibly this generation's Michelangelo. 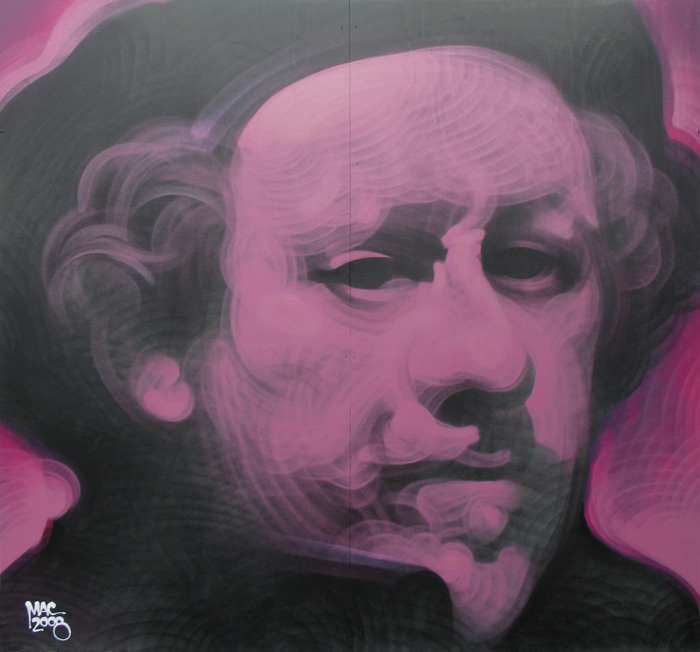 At the very least, he is the graffiti community's Michelangelo. 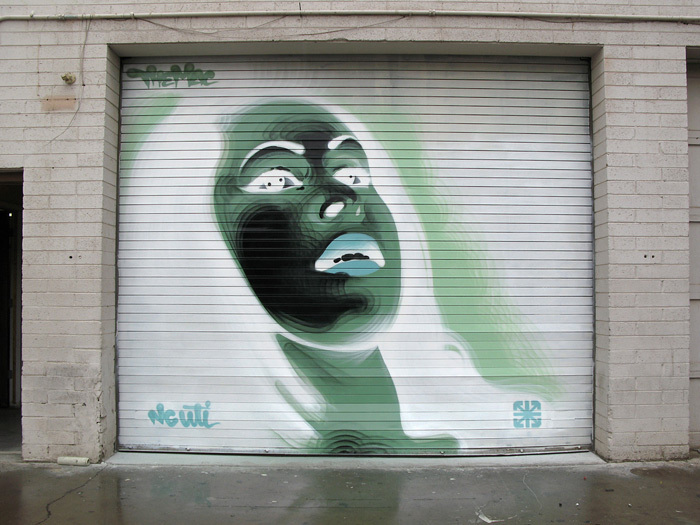 He spends his time traveling the world to paint photorealistic portraits with spray paint. He has been doing this for a number of years now, and his current work is proof that he is still innovating and evaluating his work. Photorealism is nothing new to any of us. In the world of fine art, it is what most artists strive for. And in the world of graffiti art, the story is the same. There are a few artists around the world that can do it well. But when looking at The Mac's work, it stands apart from the rest. His work is iconic and his execution is different. You can tell it's a Mac piece when you're looking at it. 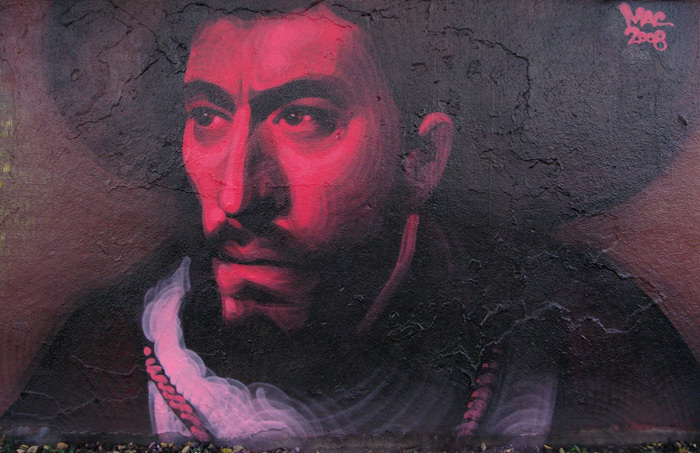 His art is important because he is pushing the boundaries of what is possible with spray paint and in graffiti. He continues to inspire and motivate artists all around the world. We had a chance to interview him recently and here is what he had to say. 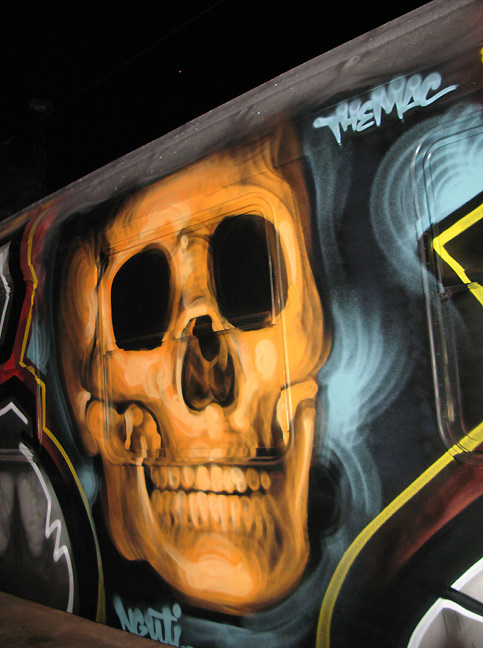 MAC: I write Mac, sometimes elmac or themac for more letters. Painting graffiti since '95. MAC: I'm down with a few crews. Nuestra Gente is based out of Phoenix, known for painting trains. UTI is an OG LA crew. 7th Letter is probably the most well known these days. MAC: My mom and Alphonse Mucha above all. Caravaggio, Vermeer, Moebius. A lot of comic book stuff. Religious art. Pin-ups. MAC: Getting to be pretty often. I was fortunate enough to have the opportunity to go to a lot of places last year. Puerto Rico, Korea, Italy, Holland, Montreal..
MAC: Yeah I've had a few, but nothing too crazy and nothing I'd wanna glamorize. Running across busy freeways, getting shot at, lots of running & hiding, climbing over barbed wire fences, hiding from cops. A bunch of dumb risks, when I should have been safe at home making stencils or something. Just kidding! MAC: I live in Phoenix and things are very controlled there. Things usually don't stay up long, there's a lot of negative public sentiment, not very art-friendly. The streets are pretty clean I suppose, but a little soulless too. It's a big city and no matter what they do there's always gonna be kids painting graffiti. By fighting graffiti so well, the result is that the stuff you do see is often not that great. There are some really talented writers, but overall the bar is low. I remember being younger and desperate to find places to paint. I would paint the most cutty hidden spots that nobody would ever see unless they went out of their way...and it would still get buffed. I think that kind of thing discourages kids from trying and really putting heart & soul into their art. MAC: I think it's been sort of tradition that homes & places of worship should be off limits. MAC: It's gotten huge, it's nuts. It's global. In the early nineties, I guess graffiti was blowing up, but it wasn't anywhere NEAR how it is now. The amount of paint brands and colors is just insane. I remember I used to mix my colors a lot because options were so limited. There was a while when the ONLY light blue you could get was Rusto Harbor Blue, since Krylon had stopped making Baby Blue. Now there's probably at least fifty different shades of light blue being made. MAC: Cool colors, blues & greens. MAC: I love both but I guess I'd have to say piecing. I like taking my time to perfect things. But bombing is good balance for that. 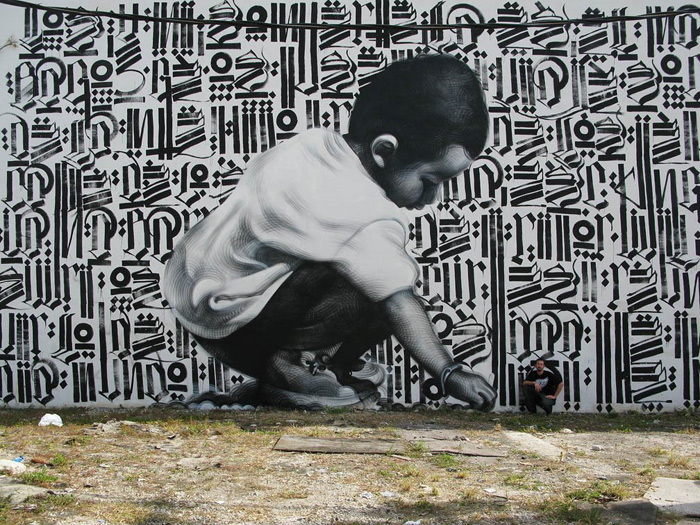 AP: You have been painting with Retna quite a bit recently. How did you hook up with him and what do you like most about your partnership? 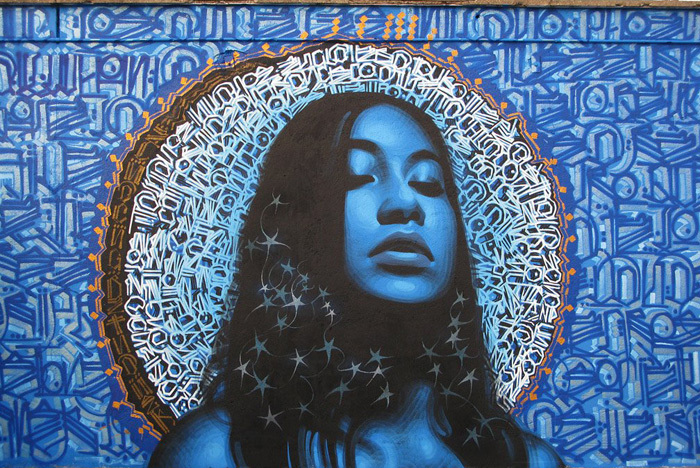 MAC: I first met Retna around 2000 in Tijuana, and we first painted together maybe around '03 in LA. He was taking fashion ads and painting around these images of models with abstract lines & colors, and I had been painting women on walls based on similar fashion models. We liked each other's work, and it seemed to make sense to try collaborating. We both bring different strengths & styles together and I think the results have been really nice. AP: Your portraits have evolved over the years. Can you describe how the evolution occurred for you? And how would you describe your current style? 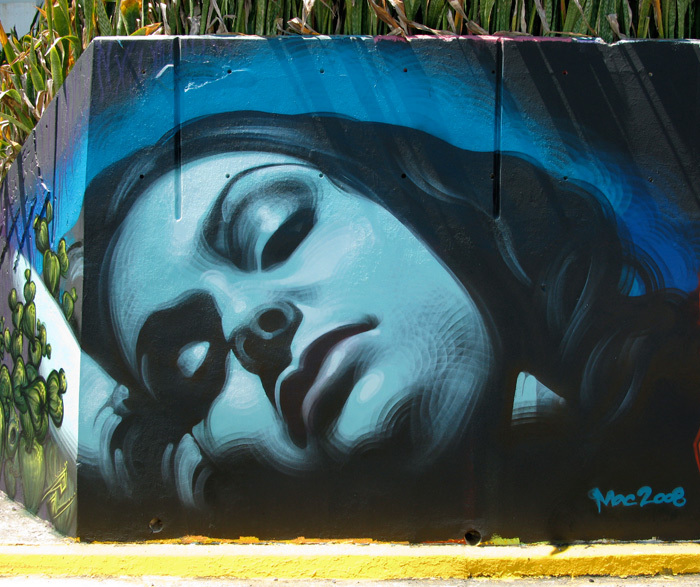 MAC: I started out very influenced by Hex TGO from LA, and just wanted to paint stuff super smooth & realistic. That was a good foundation, and then over the years I guess I've just been finding my own voice. The lines and patterns I've been using came from painting faces quickly with fatcaps in the dark. AP: The approach you have towards painting seems to be much more grounded in fine art than traditional graffiti. What is your artistic background? MAC: I've been devoting my life to art since I was a little kid. My mom is an artist, so that got the ball rolling. I never went to art school but I studied tons of art books. I really found a lot of inspiration in older classic art. As far as graffiti I actually came up around very traditional writers, and I have a huge love of traditional graffiti. AP: Your portraits and pieces are unique and culturally rooted. What do you look for when you pick photos to work with? MAC: I usually try to work from my own photos, or photos taken by friends. I just have a certain look that I go for that I'm not sure how to describe. When I paint women I try to make them beautiful, dignified. Going for something timeless. AP: What projects are you currently working on? And where are you planning to travel next? MAC: I'm working on pieces for an upcoming show in LA with Retna & Saber. Couple mural projects coming up. Possible book. A bunch of opportunities I'm grateful for & excited about. Special thanks to The Mac for taking the time to do the interview.